The Benjamin Franklin Parkway, looking down toward Logan Circle and City Hall - this picture taken at 21st Street and the Parkway. To see the Ben Franklin Parkway in all of its majesty, just click directly on the photo to enlarge it. The Ben Franklin Parkway is largely devoted to museums and cultural institutions, so there are relatively few hotels on it, or just off it. However, we've created a highly detailed Guide to Ben Franklin Parkway District Hotels to help you decide. Of course, there are many hotels near the Parkway's southern end at City Hall, as well as on or near Rittenhouse Square, that offer easy access to it. But if you want something that's specific to the Ben Franklin Parkway itself, you would probably find the Ben Franklin Parkway District Hotels Guide to be useful. The Academy of Natural Sciences is famous for its fossils, as well as its historical collection of natural specimens, and has many changing exhibits. Logan Circle - Or should it be Logan Square? Visit the magnificent Swann Fountain of the Three Rivers, and the majestic architecture, of Logan Circle. Each statue in the fountain has an allegorical, geographical meaning. The Philadelphia Museum of Art - a world-class art museum, with eclectic offerings from all over the globe, and frequent blockbuster exhibitions. And outside, in addition to its stunning architecture, the Museum of Art has the famous, iconic Rocky Steps and Rocky Statue - both of which have been made famous by the well-known series of films by actor Sylvester Stallone, a native Philadelphian. You can see the largest collection of Rodin sculptures outside of Paris - as well as enjoy the exterior Rodin Gardens and Reflecting Pool - at the Rodin Museum - located at 22nd and the Parkway. Most famously, you can get your picture taken outside, with one of the original bronze castings of The Thinker - one of the most famous statues in the world. 1) The Phlash runs only from May 1 through Halloween (i.e., the busy sightseeing season). 2) The Phlash also stops running around 6 PM or so (check its schedule for exactly when), when the major places to visit in Philadelphia have closed for the day. It really should run at least until the early evening, but it doesn't. Fortunately, SEPTA offers a wide variety of transit options, to get you to any of the things to do on the Ben Franklin Parkway. The Orange Line / Broad Street Subway has a stop at Race/Vine, which puts you at Broad Street between Race and Vine Streets. 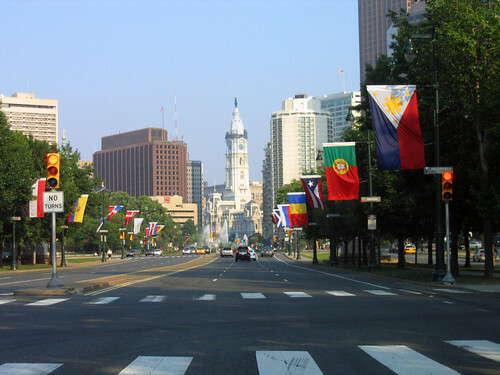 If you head west on either Race or Vine, you will reach the Ben Franklin Parkway, which is a diagonal boulevard, running southeast from the Museum of Art, down to City Hall. One stop south of Race/Vine, the Orange Line also has a stop at Philadelphia City Hall - which, when you leave the subway, places you at the intersection of Broad and Market Streets (with Broad Street as the "14th Street"). City Hall is the absolute southern end, of the Ben Franklin Parkway (as you can see from the photo on the top of this page). You can walk it all the way up to the Philadelphia Museum of Art, although it's a pretty long walk - about 1.5 miles. The Blue Line / Market-Frankford Line / "el" also takes you to the base of the Ben Franklin Parkway. Its central station is 15th Street Station, located at 15th and Market Streets, adjacent to City Hall. (You are permitted literally free interchange, between the Blue Line at 15th Street, and the Orange Line at City Hall). Once you leave 15th Street Station, you just walk up the Ben Franklin Parkway, just as you would if you were leaving City Hall. 30th Street Station - located at 30th and Market Streets, and provides Amtrak service as well as SEPTA Regional Rail trains. For the Ben Franklin Parkway, Market East is the furthest away, although you can walk to it from there. If your goal is convenience, your best bet is Suburban Station. After you get off the train, if you follow the signs in the underground Concourse for 17th and 18th Streets, you'll emerge onto street level, and you shouldn't have any trouble finding the Ben Franklin Parkway, as there will also be visitor-friendly signs guiding you on the corners. As for 30th Street - that is only of value if you're headed to the Museum of Art, and even then, it's kind of complicated, because you need to cross the Schuylkill River. Bottom line - if you're going somewhere on the Ben Franklin Parkway, get off the train at Suburban Station.